Gospel page located at the Matenadaran. ﻿﻿﻿The J. Paul Getty Museum and the Western Prelacy of the Armenian Apostolic Church have agreed to extend the mediation deadline in their dispute over possession of the Zeyt’un Gospel pages. The church sued the Getty in Los Angeles County Superior Court in 2010, charging that the museum obtained stolen property. The church seeks the return of seven pages, parts of an illuminated Bible created in 1256 and currently located in Armenia. 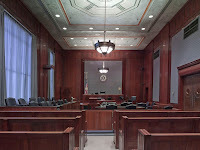 On November 3, 2011 the court ordered the parties to mediate, scheduling a review hearing for March 2012. The Getty and the church later filed a stipulation with the court to extend the mediation deadline to April 27 and to schedule the review hearing for May 4. The stipulation states: "The parties were unable to agree upon a mediator. Accordingly, on December 16, 2011 the Court ordered the parties to agree upon a different timeline for the completion of mediation."